Project obstacles and solutions: Spartech announced plans to expand its Muncie, Indiana packaging facility during the summer of 2012. Spartech hired Attlin Construction to add 60,000 square feet onto their current factory floor, plus an expanded parking lot. Spartech had plans drawn up for the expansion. The specs called for a 5 inch concrete floor with joint placements at column lines, or control joints at 25' and 30'. Normally a 5 inch slab would require that joints be placed at a maximum spacing of 15'. Jerry McConnell, the project engineer, and Boyd Franklin from Attlin became concerned that the control joints were too far apart and the concrete would crack excessively. They expressed this concern to Spartech. However, Spartech wanted to keep the control joints to a minimum. Cracking in concrete can be caused by a number of different reasons. New concrete shrinks as it cures. Control joints are used to control the cracking and limit them to the joint areas. The group turned to IMI for a solution. IMI came up with four different options that were presented to the Spartech engineers. They chose an option that included changing the mix design to a low shrinkage concrete and changing the subgrade design so the concrete would float atop the aggregate base without bonding to it. The joint spacing was changed to 15'x 25' which is 10' beyond the ACI maximum spec. 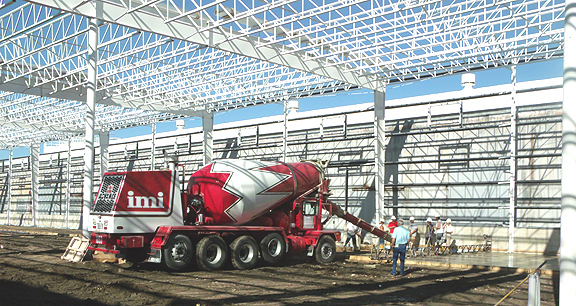 IMI delivered 1,125 yards of concrete for the floor of the facility. To date, this has been successful in minimizing random cracking. With Boyd Franklin's help, the exterior paving for their parking lot was changed from asphalt to concrete. IMI supplied another 600 yards of concrete for this part of the project. The Spartech expansion became operational in November 2012. For more information on controlling cracks in concrete, click here.